In this basic mouse tutorial you will learn the anatomy of a mouse .... only kidding!!! That was just to make you relax that death grip you have on the poor little rodent (smile). 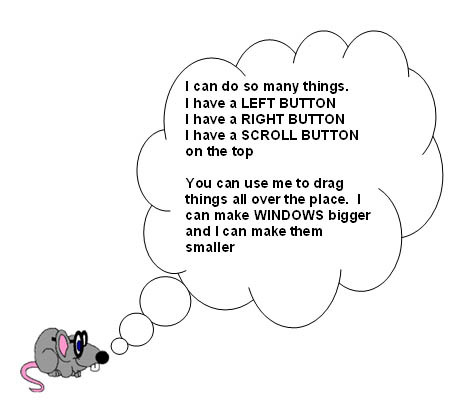 In this mouse tutorial your mouse does not have eyes, a mouth or bones ... it just has two buttons, a left button and a right button. It also has a little wheel on the top that allows you to scroll up and down a page. The left button is used to select an item with just one click. To open an item, you have to double click the left button. When you double click the left button, it is not click-(pause)-click - it is a quick tap-tap. In this basic mouse tutorial you will also learn how to highlight text, how to move text, and also how to change the color of text. Even though this is just a basic tutorial, you will also learn how to find and insert a graphic. There is no confusing computer jargon - just plain English and step-by-step instructions. The very best part of this particular basic mouse tutorial is that it is absolutely FREE! Basic Tutorials but first click and download your free Basic Mouse Tutorial. Do you know everything there is to know about your Keyboard? If not just click on the KEYBOARD link below for more information on my magic Keyboard Tutorial.